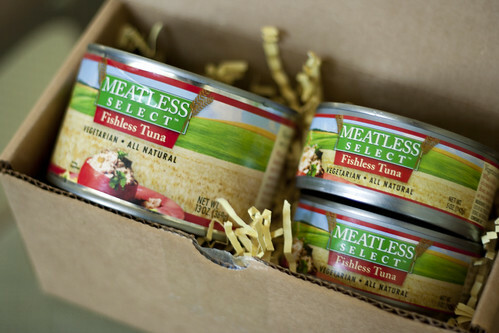 » Review: Meatless Select’s Fishless Tuna Don’t Eat Off The Sidewalk! If you’ve visited my site for any length of time, you know that I love trying out things and sharing what I like on here, and 95% of the time it’s things i’ve purchased myself. And while I enjoy getting free things as much as the next person, I won’t accept anything for review if it’s something that I would never buy myself (sorry, juice fast companies). When Melisser told me that Vegan Cuts was going to set up some product reviews and listed off the choices, none of them caught my eye, so I told her to let me know if anything else was going to come down the pipes. She replied back and said, “Well, this might happen…” and I immediately said “YES. YES. SEND ME THE FAKE TUNA.” I am not a health vegan, I love faux meats and the fact that it could be totally gross actually made me want to try it more. If you aren’t interested in reading my whole wordy review: doesn’t taste much like tuna but the taste and texture itself are good, the value/price is pretty good, if you miss actual tuna in a way that chickpeas can’t fulfill, you will like this. If you subscribe to the snack box, make sure you at least scroll to the bottom! Let’s do this review Q and A style! Q: Does it taste like tuna, or even worse, Tuno? A: I haven’t eaten tuna for 20 years, but i’m pretty sure it doesn’t taste like tuna and since I didn’t spit it out, definitely not like Tuno. When you open the can it just looks like large TVP (and it is made from soy), but the texture is a little different. It doesn’t exactly flake like tuna, but it appears that they were going for that since the larger pieces do pull apart a bit. It comes packed in water and has a vaguely fishy scent and taste, nothing that will scare you away if you think fish smells really gross. And if you like fish, you will probably actually find the taste a little overwhelming. I made three things with it: sandwiches, tuna mac, and tuna pot pie. For the sandwiches, I used the Nasoya whipped mayo that I recently found in my store (side note, it was my first time trying the new Nasoya and as I was opening it and getting ready to taste it with a fork I was telling Brian [who was making a disgusted face the whole time] about Bianca’s review and when I tasted it I said “OH MY GOD IT DOES TASTE LIKE MIRACLE WHIP!” and then he left the room, dry heaving). I mixed them together (after draining the can) and added some capers because I was sans relish, loaded up a leftover hot dog bun, and shoved it into my mouth. Now like I said, I haven’t had tuna in a long time so I can’t make claims that it was anything like a tuna fish sandwich but I liked it. You might expect little soy chunks that have been soaking in water to be a little squishy even with pressing the liquid out, but they weren’t. I went to the store two days later to pick up some relish, and I baked some bread to make pretty photos (massive amounts of tuna added to the sandwich for pictures, I put half of it back in the bowl before I ate it). Tuna mac may be a midwestern thing, so if the idea makes you ill, i’m sorry. My brother really liked it, but I would never eat it because it seemed like an unholy union. Brian used to love it though, so we made it. In hindsight, I should’ve picked up a bag of Daiya and tried to go for something closer to Kraft instead of making cashew mac and cheese. I decided to cook the tuna in a pan with a little cooking spray before adding it in because it just seemed right. In the end, we agreed that we couldn’t really taste the tuna (partly because I only used one small can and we made a lot more pasta than you would get in a box of Kraft) so in this application, it was wasted. Onto the pot pie. When I was a kid, Tuna Helper made a tuna pot pie. They don’t make it anymore and there is even a facebook page about that fact. The reason that I liked it so much is that it had this magical topping that was almost like a savory cake – it had zero to do with the fact that tuna was included. Even though I knew I wasn’t going to be able to recreate that, I went for it anyway. 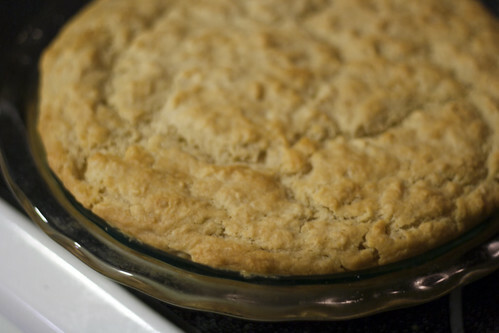 I didn’t follow a recipe for pot pie, I just took my favorite biscuits and gravy recipe, making this biscuits wetter than normal since I wanted them to spread on top of the pie. I pulled out some emergency frozen veggies (in this case, a pepper-onion mix and peas), sauteed them to defrost, and added two of the large cans of tuna. 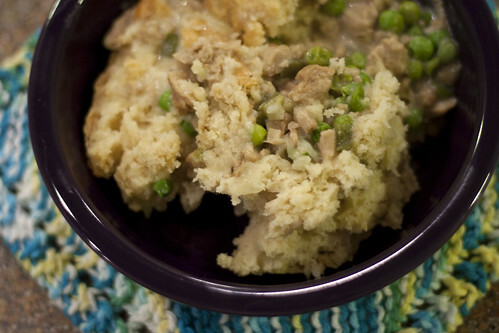 I made gravy and mixed the two pans together, spooned on the biscuits, and smoothed them out. It came out super pretty and was delicious. It definitely tasted more tuna-y than the mac because I made the tuna the bulk of the filling. I didn’t heavily season the gravy any which way because I didn’t want it to taste too thyme-y or like sage. Q: Can’t you just use chickpeas for tuna fish sandwiches like vegans have done since the beginning of time? A: Yes, of course, but I think that’s true for most vegan convenience products. We can always use cheaper, less processed ingredients if we want. 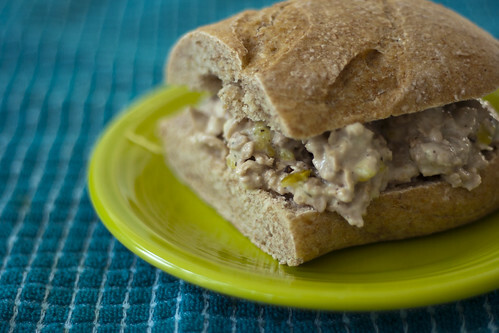 I love chickpea salad sandwiches, but we all know that they don’t actually mimic tuna in any way. If you want something that’s closer in taste and texture to tuna, definitely give this a try. I would also love to see this in regular supermarkets because as we all know, tuna fishes have been in danger for years, but people still reach for fish as a ‘healthier’ alternative, even though tuna is full of mercury. If there were cans of fishless tuna right next to the regular tuna, it would give non-vegetarians an easy alternative to reach for. Q: It’s probably expensive though, right? A: A single 5 oz can of Fishless Tuna, the smaller size, retails for $2. I looked up tuna prices and from what I can tell, a can of actual Tuna normally sells for $1-$2.50, based on the brand and where you buy it. So in comparison to real fish, it can cost twice as much or about the same. For a vegan item however, I think it’s a decent price. I actually guessed a small can would be $2-3 before I looked up the price, but that was because I assumed that regular tuna is much cheaper than it is. When Vegan Cuts puts it up on their deal (this week, I assume), it will be $39 + $5.95 SH for a 12-pack of the 13 oz cans. I was able to get two sandwiches out of the 5 oz cans. Q: So would you buy it? A: Yes! Like with all specialty items I wouldn’t buy it regularly because i’m on a tight budget, but if I got a craving for another tuna pot pie or wanted to make sandwiches for a tuna-loving skeptic, I would. Included in my box was a form that you can fill out and give to your local grocery store to request that they carry Meatless Select items, which I will. There aren’t any health food stores around, but there is a Kroger with a great natural foods section and I think I have a good chance of getting them to carry this stuff. I also want to try their man of taco meat because I love tacos and things that come in cans. Do you subscribe to the Vegan Cuts snack box? The September box, which is shipping early this week, will have a can of Fishless Tuna for you to try! So if your curiosity has been piqued, you won’t have to wait long to satisfy it. Disclaimer: This post contains affiliate links to Vegan Cuts, meaning if you click through and purchase something, I will get a small referral fee. The product in this post was sent to me for review purposes, but my opinions are always totally honest and if I thought it was gross, i’d say so.